CMB Engineering has been named as National Apprentice Employer of the year at this years Investors in People Awards. 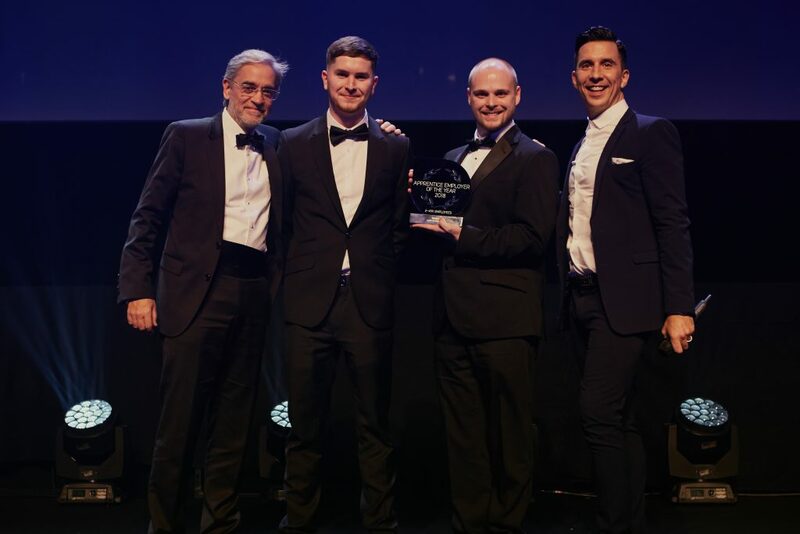 CMB Engineering has been named as a leader in people management practice globally, having won Apprentice Employer of the year for an organisation of its size at the Investors in People Awards. The Awards celebrate the best people management practices amongst Investors in People accredited businesses and this year winners were announced at a spectacular awards ceremony and dinner at The Roundhouse, Camden, on 28 November 2018. The Apprentice Employer of the Year category celebrates organisations who provide fantastic opportunities for apprentices in their organisation to learn, develop and progress. They understand that the apprentices of today have the potential to be the business leaders of tomorrow. This has become another successful achievement for CMB Engineering with Investors In People, having recently achieved Investors In People Gold in March 2018. The success of the achieving the Gold Award is what motivated and drove CMB to apply for the Apprentice Employer of the Year category for this years Investors In People’s Awards. Collecting the Award on CMB Engineering’s behalf was our own Mike Borley (Office Manager) and Jack Henry (4th & Final Year Apprentice). Dive in and view our articles grouped by category.